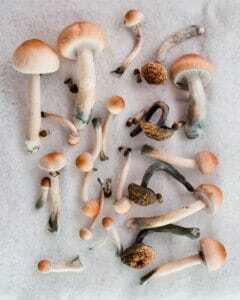 Psilocybin Mushrooms are a commonly abused hallucinogen. Although less addictive than other substances, they are still dangerous to use. Psilocybin mushrooms, also called magic mushrooms or shrooms, are hallucinogenic mushrooms containing the chemical psilocybin. Magic mushrooms are popular for their psychedelic effects, often creating a mind-altering experience in the user. Traditionally used in indigenous communities to connect to the spirit world, magic mushrooms gained popularity in the 1960s throughout the hippie movement. They are also commonly abused at music festivals today. Illegal since the 1970s, the psychedelic mushrooms are typically eaten fresh or dried or brewed in tea. It is also common to consume bake psilocybin mushrooms into food such as cake and eat them. Psilocybin mushrooms may also be dried up and crushed into a powder that can be injected, sniffed, or put into capsules and swallowed. Users generally begin to feel the effects between 20 minutes to 2 hours after ingestion; the effects typically last 3 to 6-hours and include anxiety, restlessness, chills, and euphoria. In some instances, the effects of mushrooms can last up to 3 days. The perception of changes in time and feelings of relaxation can tempt people into misusing the mushroom. In extreme cases, people who have used magic mushrooms have hallucinated to the point of enduring physical pain or causing pain to others. Continued use of magic mushrooms can create long-term psychosis. Based on research by The Johns Hopkins University School of Medicine, even one strong dose of psilocybin mushrooms can alter a person’s personality for more than a year, and perhaps permanently. There is a debate over whether or not magic mushrooms are addictive. Like any substance, someone can become dependent on the substance for different reasons. The more someone uses mushrooms, they may begin to crave more of the substance. In some cases, individuals may prefer to combine psilocybin mushrooms with another substance for a difference effect, especially LSD. For this reason, people are more likely to become psychologically addicted to psilocybin mushrooms than physically addicted. The severity of dependency or addiction often depends on the number of mushrooms someone consumes. People curious about mushrooms can become dependent because of the mind-altering effects and the unpredictability of good or bad “trips” mushrooms can produce. Someone increasing their frequency of psilocybin mushroom use, may isolate themselves to use mushrooms, combine them with other drugs, or show an increased tolerance. As a result, they may need to contact a treatment professional for rehab, or family members may need to hold an intervention. Because of the habit-forming nature of magic mushrooms, people can experience withdrawal symptoms of psilocybin mushroom. Not only will someone abusing psilocybin mushrooms become accustomed to the altered state of mind they bring, they can have trouble living in “the real world.” They may have memory loss and continue using psilocybin mushrooms to maintain their altered state. 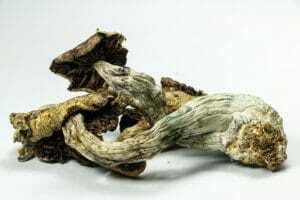 Some psilocybin mushroom users suffer from flashbacks from the hallucinogenic drug, fatigue, and irritability. Users going through withdrawal may experience confusion and difficulty determining reality. Psilocybin mushroom treatment is needed if someone clings to the drug so much they become out of touch with reality. This signals a much bigger problem. One of the best ways to ween a psilocybin mushroom dependency is to stop eating mushrooms. Because they are not as powerfully addictive as many other substances, individuals with psilocybin mushroom dependencies have a greater chance to overcome a dependency. If someone has combined psilocybin mushrooms with other substances like alcohol, benzodiazepines, stimulants or opioids, detox is needed for restoration. Summarily, detox would help the person using multiple drugs prevent further addiction to other substances before it gets worse. Detox would include cutting-edge medication to cleanse the body of harmful substances with polydrug use. Contact a treatment professional to explore your treatment options.